Hair follicles are formed during embryonic development and continue to undergo recurrent cycles of growth and regression throughout adult life. Embryonic hair follicle development is initiated by the so "first dermal signal", originating from dermal fibroblasts, which leads to the formation of placodes in the embryonic epidermis at approximately E13.5. In consequence, underlying dermal condensates aggregate. Epithelial placodes are local thickenings, which define the location of the hair follicle. The placodes grow downward, giving rise to the germ by E15.5, the peg by E17.5, and the bulbous peg by E18.5. At the bulbous peg stage, epithelial cells envelope the underlying dermal mesenchymal condensate, forming the dermal papilla. The matrix is the highly proliferative leading front of the growing epithelial cells, which maintains constant contact with the dermal cells. The outer layer of the epidermal invagination is called the outer root sheath (ORS), which makes contact with the basement membrane. The inner root sheath (IRS) forms the channel for the protruding hair. 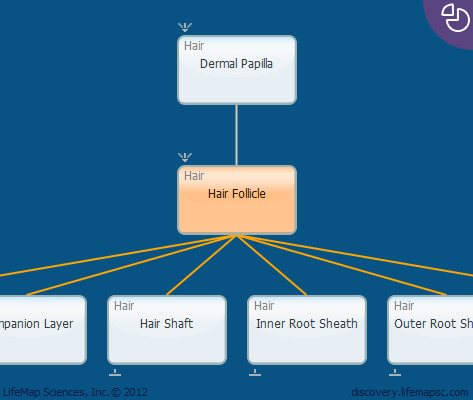 During hair follicle formation, matrix cells give rise to seven different types of terminally differentiated cells. Hair shaft cells can be first distinguished at approximately E18.5, concurrent with the appearance of the sebaceous gland precursor cells. In the two-week-old mouse, the mature hair follicle enters the destructive phase, called catagen. During this phase, the hair follicle is reduced to an epithelial strand and the dermal papilla rests below the non-cycling follicle. After the catagen phase, the hair follicle enters the telogen, or resting phase, which lasts for up to two days during the first postnatal hair cycle, and for up to two weeks in the second cycle. During telogen, the lower cycling part of the hair follicle reaches its minimal size. During the subsequent anagen, or growth phase, the bulge stem cells repopulate the cycling compartment of the hair follicle and create the new hair germ. A new hair follicle is generated and enters a new growth cycle. The hair follicle includes a stem cell reservoir, called the 'bulge', which is located adjacent to the existing hair shaft. These cells are less proliferative than other skin epithelial cells but are active during the anagen phase and contribute to the formation of the new hair follicle.